Jacob, the second Bishop of Nisibis was appointed in 308, and Ephrem grew up under his leadership, and was a friend. We know that “Jacob of Nisibis” is recorded as a signatory at the First Council of Nicea in 325. Jacob appointed Ephrem as a teacher, and began to compose hymns and write biblical commentaries as part of his educational office. Very soon after his death in 373 while tending to plague victims, he was cannonized and declared a Doctor of the Church by Pope Benedict the XV in 1920. He contributed much to building up the foundation of the Church that we have today. In fact, the newly excavated Church of Saint Jacob in Nisibis, where Ephrem taught and ministered can be seen today – a rare and mystical find. You and I as Catholics are called to pray for all of our brothers and Sisters, and especially our Spiritual Leaders. St. Ephrem is the patron saint for Spiritual Directors and Spiritual Leaders. 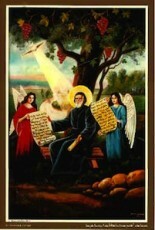 Many of them call upon St. Ephrem today for his intercession in times of trouble and discernment. We can all join in, praying for our spiritual leaders and directors, just as St. Ephrem has taught us. In fact, all of our spiritual leaders in Newman Centers across the country can benefit by seeking out the intercession of St. Ephrem. Here is a prayer that is widely used today. O LORD, Master of my life, grant that I may not be infected with the spirit of slothfulness and inquisitiveness, with the spirit of ambition and vain talking. Grant instead to me, your servant, the spirit of purity and of humility, the spirit of patience and neighborly love.